...In 1967, Harris continued on his flamboyant journey. Gypsy Joe’s wild and audacious wardrobe might’ve made even Hendrix blush that year, and his nonpareil style astounded crowds and opponents just as Jimi did at the Monterey Pop Festival that year. 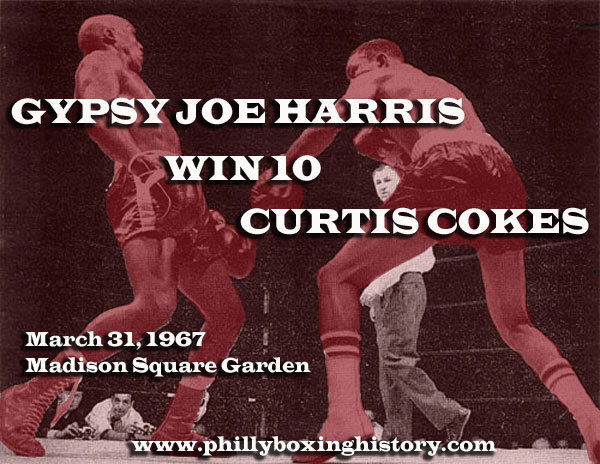 On March 31, Harris decisioned Cokes over ten rounds at Madison Square Garden. Cokes was a textbook stylist, just as Eric Clapton was a precision guitarist. Cokes wasn’t referred to as “God” like Clapton, but Cokes’ jabs, crosses and hooks are what every traditional trainer would appreciate and endorse. Testimony to Cokes’ abilities is that he went 2-1 against the great Luis Rodriguez from 1961-1966. In his last bout with Rodriguez on July 6, 1966, Cokes stopped Rodriguez in the fifteenth round. Rodriguez was one of the most underrated and classy boxers in history, and was only stopped three times in his 121 bout career. A natural welterweight, Rodriguez beat Bennie Briscoe and Rubin Carter, and fought four nip and tuck battles with Emile Griffith. If there was a truly fluid and smooth technician of the 1960s, it was Luis Rodriguez. It was like Clapton out-dueling Jeff Beck.